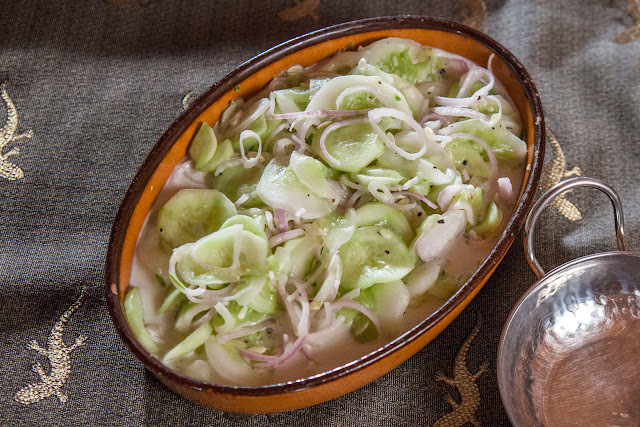 The Colors Of Indian Cooking: Cool, Quick Cucumber and Shallot Salad. Make Ahead, Take Away. 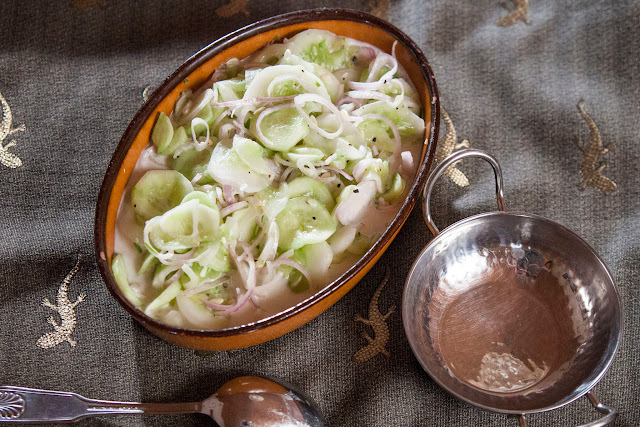 Cool, Quick Cucumber and Shallot Salad. Make Ahead, Take Away. As I was saying the other day, I went a little bit crazy at the Farmers Market. I piled on the vegetables and then went home and put together a menu of easy, make-ahead dishes that I thought would work well for the coming Summer Party Season. Totally coincidentally they turned out to all be vegan and gluten free. Now this is not something I deliberately set out to do. The first thing I think about when planning a meal is not necessarily it's veganess (is that even a word?) or it's lack of gluten (unless I'm cooking for friends who are vegan or gluten free.) No, I was thinking about the whole catalogue of Indian salads and how they could substitute for the traditional coleslaw, baked beans or corn on the cob and put a bit of a spin on hot weather cooking. 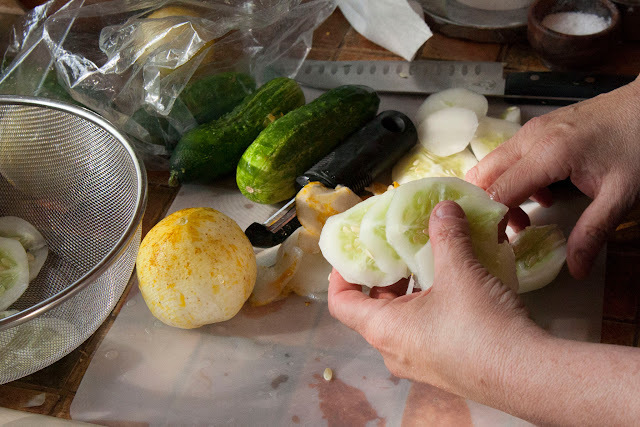 The first thing that caught my eye at the market that Friday morning was cucumbers. Lemon cucumbers to be exact. 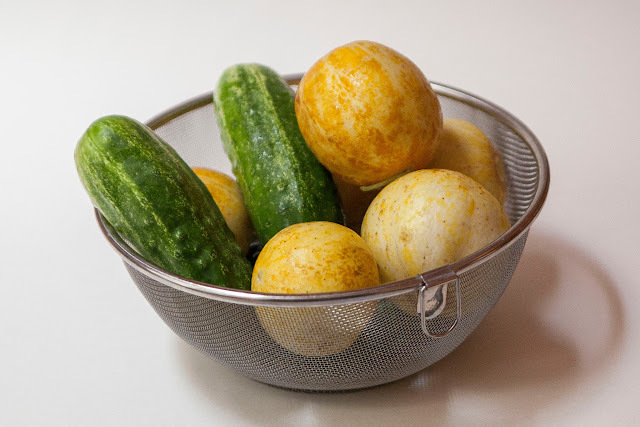 I also snapped up some pickling cucumbers aka, "kirbies". Here's a group shot. 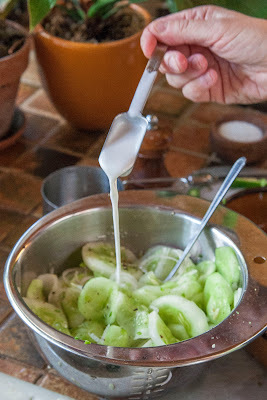 Indian cuisine has many recipes for cucumbers. 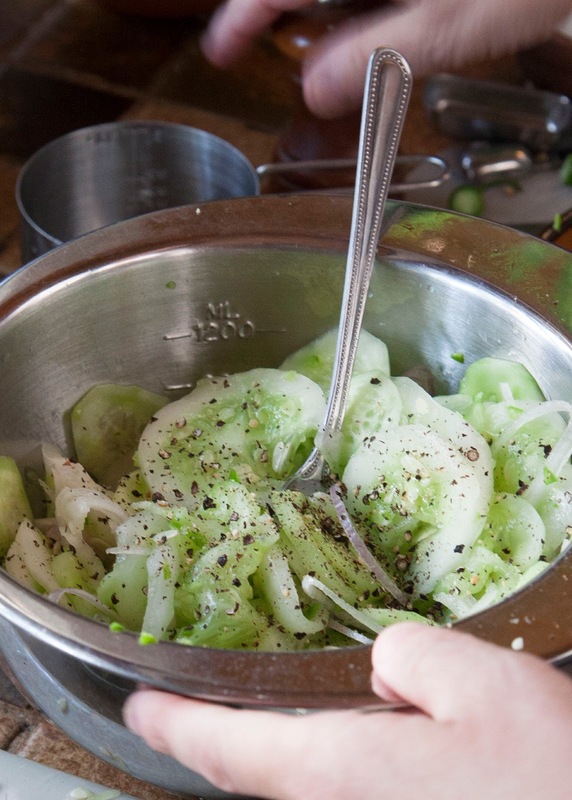 They're a great refreshing add-on to a Tandoori meal or any other spicy dish. Rather than the pale, tasteless chunks I remember being tossed in my childhood salads like poker chips, these cukes can definitely stand on their own as the center of a dish. These cucumbers are paired with coconut milk, lime juice and one of my favorite ingredients, shallots. Shallots if you've not cooked with them, are sort of a cross between onions and garlic. They originated in Southeast Asia and then showed up in India where they quickly became a staple. 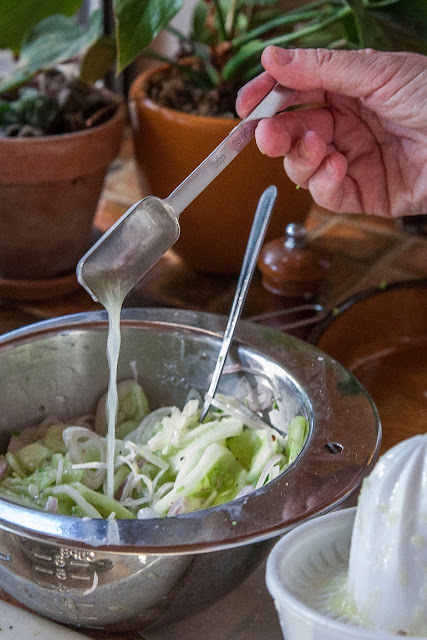 I can't get enough of them and always love a recipe that features them. 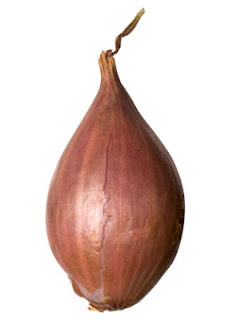 When I first heard of shallots I couldn't help but think of the poem we learned in Freshman year English, The Lady of Shallot. If you've not heard of her, she was this babe who stayed home A LOT and kept up with the world outside by staring into a mirror that reflected everything back at her. I think she was the first blogger. In the poem she winds up floating down the river singing, trying to get Sir Lancelot's attention. Of course by the time he notices her she's dead! Hello! Very Game of Thrones. 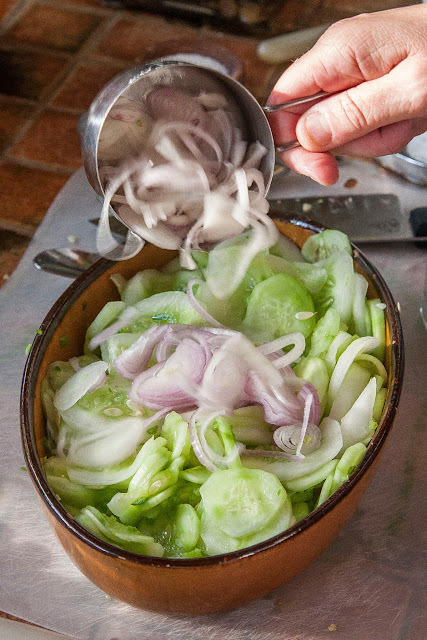 Unfortunately, shallots as I know them are usually always tucked away behind big bins of onions and garlic so if you've never used them, here's an easier way to tell them apart. 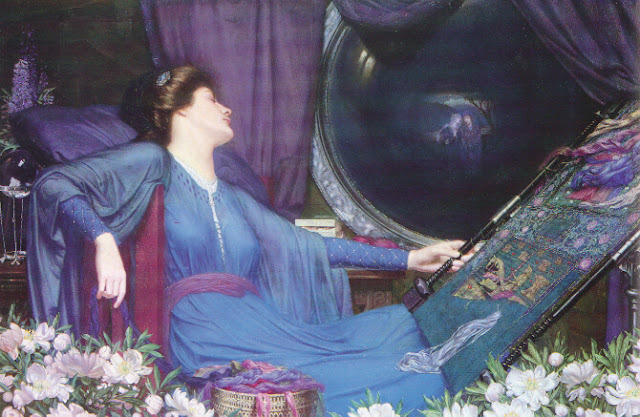 This is The Lady of Shalott caught updating her Facebook status. So, back to cucumbers and their relationship with these elusive shallots, here's an easy first date you can whip up for these two vegetables with very little time and effort. 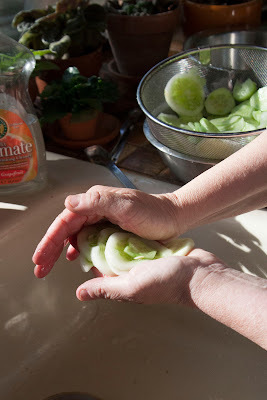 Peel and slice the cucumbers into thin rounds. 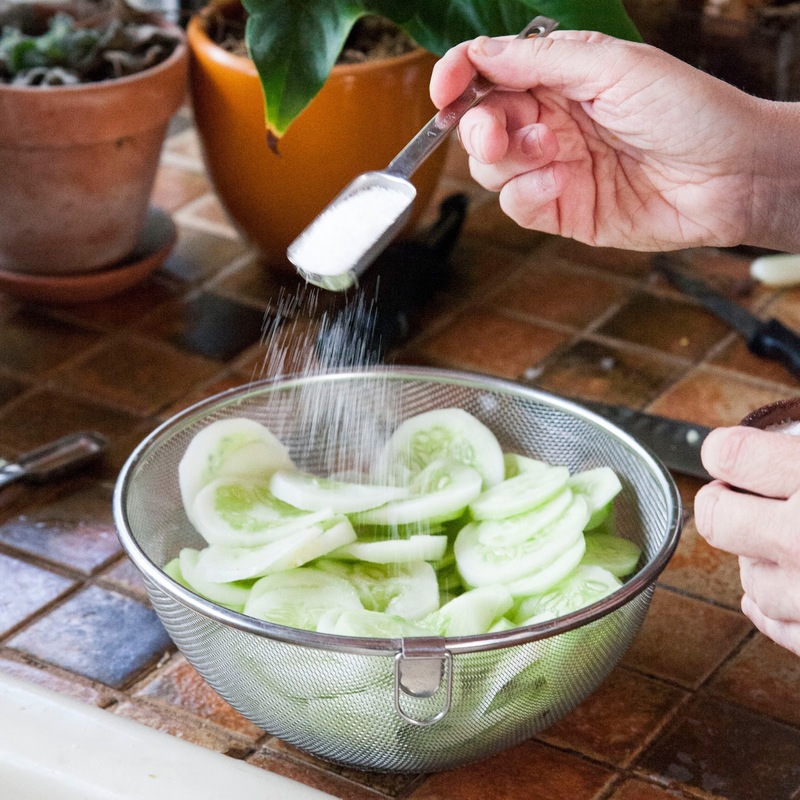 Place them in a colander and sprinkle them with about 3 Tbs of kosher salt. 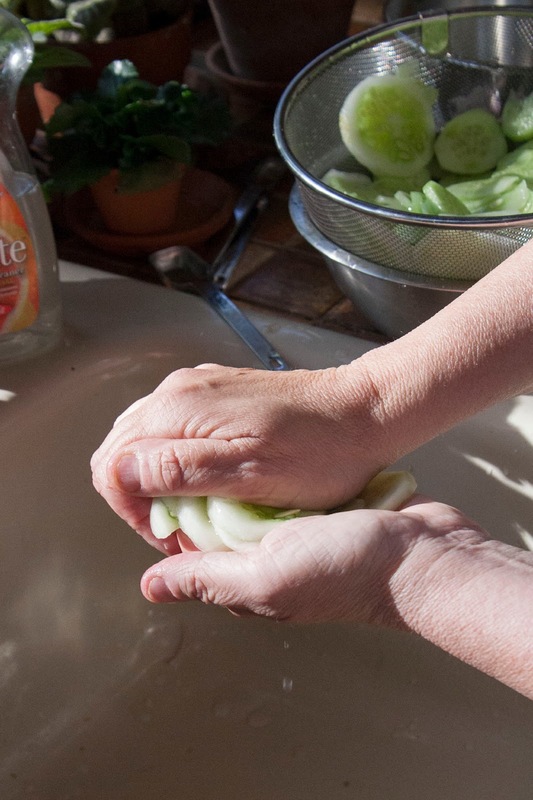 Massage the salt into the cucumbers and set them aside to drain for about 30 minutes. Rinse them in cold water getting all the salt off. 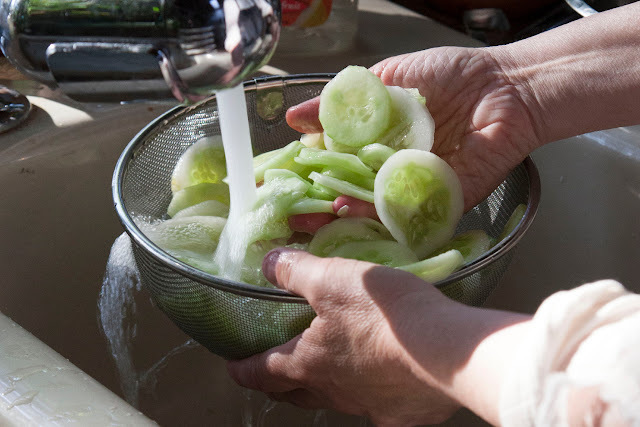 Press the excess water out of the cucumbers. Set them aside to dry a bit. Place sliced dried cucumbers in a bowl. Add in the chopped green serrano chilies. Add in 1 cup of thinly sliced shallots. Add in 1 and 1/2 tps of kosher salt and the ground black pepper. Toss everything together well. Serve it up. Simple, fast, and it also happens to be vegan and gluten free. 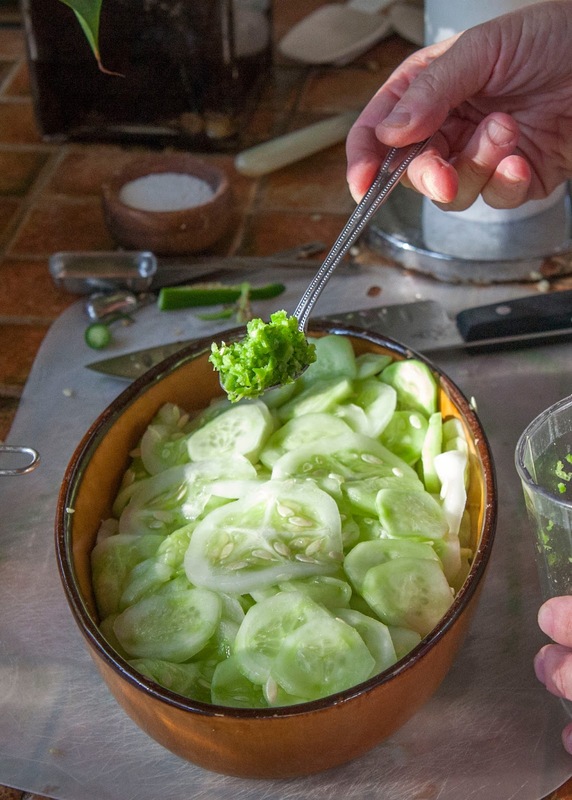 Try this as a side dish at your next cook out. It may make you consider the lowly cucumber as more than Mother Natures' poker chips. salad is necessary when you go to eat nonveg food, it help your digested the food very easily, hardly it take half and hour, salad can be made of different type of things.